Avila (pronounced AH-vee-lah) spent the entire season with Lake Elsinore (A), going 7-9 with a 4.27 ERA (62 ER, 130.2 IP) across 24 appearances (20 starts)...Earned California League Mid-Season All-Star honors and logged a career-high 130.2 IP...his 142 SO led all LE hurlers, ranked second in the CAL and third in the Padres' system...Allowed three earned runs-or-fewer in eight of his 10 outings (3.72 ERA) in the first two months of the season from 4/8-5/31...For LE, earned the win in each of his six outings (three starts) from 7/5-8/5...went 4-0 with a 2.67 ERA (9 ER, 30.1 IP) and 33 SO against eight BB over the stretch...Recorded four double-digit SO games, including a season-high 11 punchouts in his season finale on 8/29 at Inland Empire. 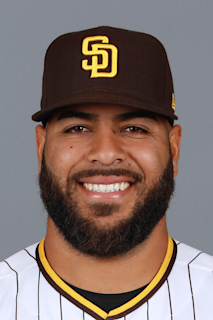 April 12, 2019 San Diego Padres optioned RHP Pedro Avila to Amarillo Sod Poodles. April 11, 2019 San Diego Padres recalled RHP Pedro Avila from Amarillo Sod Poodles. November 20, 2018 San Diego Padres selected the contract of Pedro Avila from Lake Elsinore Storm. October 12, 2018 RHP Pedro Avila assigned to Bravos de Margarita. April 1, 2018 RHP Pedro Avila assigned to Lake Elsinore Storm from Fort Wayne TinCaps. September 13, 2017 RHP Pedro Avila assigned to Fort Wayne TinCaps from Tri-City Dust Devils. September 9, 2017 RHP Pedro Avila assigned to Tri-City Dust Devils from Fort Wayne TinCaps. June 12, 2017 RHP Pedro Avila assigned to Fort Wayne TinCaps from Lake Elsinore Storm. December 2, 2016 RHP Pedro Avila assigned to Lake Elsinore Storm. October 3, 2016 Hagerstown Suns activated RHP Pedro Avila from the 7-day disabled list. August 8, 2016 Hagerstown Suns placed RHP Pedro Avila on the 7-day disabled list. July 17, 2016 Hagerstown Suns activated RHP Pedro Avila from the temporarily inactive list. July 12, 2016 Hagerstown Suns placed RHP Pedro Avila on the temporarily inactive list. April 19, 2016 RHP Pedro Avila assigned to Hagerstown Suns from GCL Nationals. March 17, 2016 RHP Pedro Avila assigned to Washington Nationals. August 19, 2015 RHP Pedro Avila assigned to GCL Nationals from DSL Nationals. May 29, 2015 RHP Pedro Avila assigned to DSL Nationals. July 5, 2014 Washington Nationals signed free agent RHP Pedro Avila to a minor league contract.